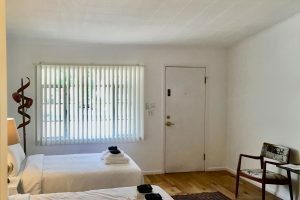 Located in the Carriage House building, this King Bedroom has a private bathroom with tub / shower combo and our standard amenities package. This is a pet-free room. 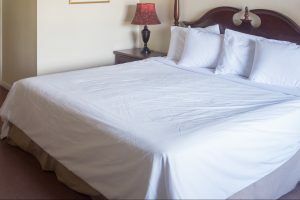 Located in the Carriage House building, this Double Bedroom has two full beds, private bathroom with walk in shower, air conditioning, natural bath products and complimentary Wifi. This is a pet-free room. Located in the Carriage House building, this large Queen Suite boasts a separate bedroom, living room, full kitchen and private bathroom. This is a pet-free room. 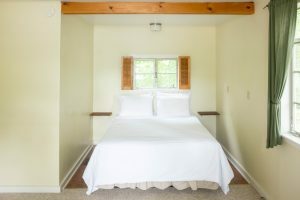 Located in the Carriage House building, this large queen bedroom has a private bathroom with tub / shower combo, sitting area, cafe table and chairs, air conditioning, natural bath products and complimentary Wifi. This is a pet-free room. 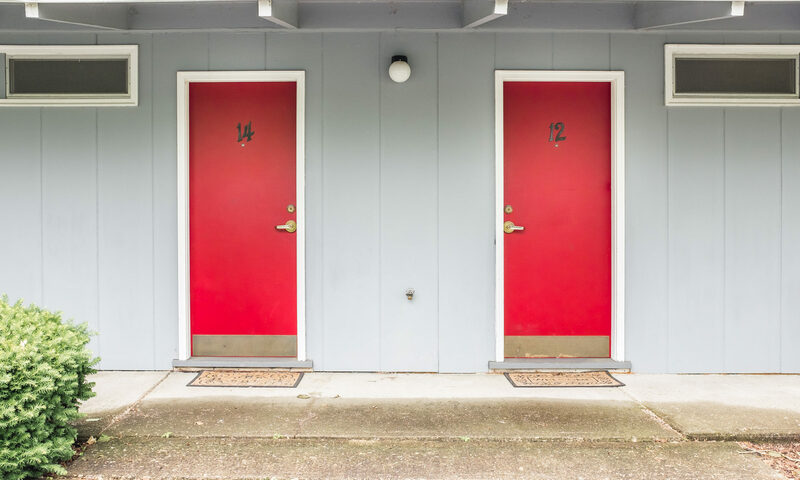 The design of these 1940's cottage suites is said to have been based on that of buildings located at the military school in West Point, NY. Each suite has a private bedroom, full kitchen and small living room with a full futon that may accommodate additional guests. Dog friendly. 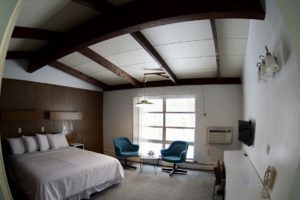 Treman Lodge rooms have a spacious mid century design. A clean and vintage-modern feel, each queen bed room has an ensuite bathroom and a large picture window that overlooks grass, trees, and bird feeders in season. Dog friendly. 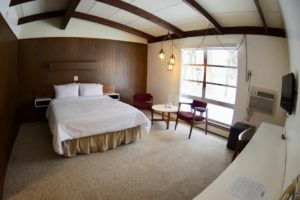 Treman Lodge rooms have a spacious mid century design. A clean and vintage-modern feel, each king bed room has an ensuite bathroom and a large picture window that overlooks grass, trees, and bird feeders in season. Dog friendly. 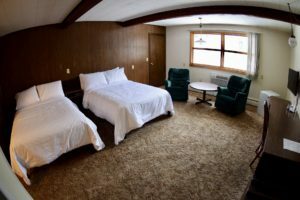 Treman Lodge rooms have a classic mid century design. These extra spacious rooms have two full beds and boast 450 sq. ft. with en suite bath and the ability to connect to another double room, and optional access to a full kitchen. Dog friendly.